You might recall that I spent several days cooking with the student gardeners at Fairmont Elementary this summer in the garden. While the recipes were kid friendly and pretty easy to make, they are also delicious enough for adults too! 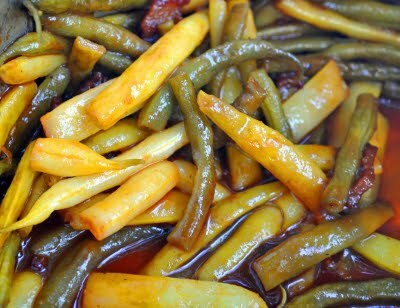 As I was cooking with one of the kids today she said the BBQ Green Beans we made were her favorite, and that reminded me that I hadn’t shared this recipe with you. If you get tired over your basic steamed green beans, this recipe will introduce new life into the tired bean. And remember, just because summer is ending doesn’t mean you can’t make BBQ! Heat a large saucepan over medium high heat. Add bacon and cook until crispy. Add onion and cook until slightly softened, about 3-5 minutes, stirring occasionally. Add beans, sugar, ketchup, vinegar, salt and Worcestershire sauce and stir together. Cover and bring to a boil, then reduce heat to simmer and cook, covered, until beans are tender crisp.